I’m doing a few Irish craft beer demos over the next couple of weekends with the Theatre of Food crew. This weekend I’m off to the Dublin Tall Ships festival with my partner-in-beer, Kristin Jensen of Edible Ireland, and the following Sunday I’ll be at Electric Picnic with Claire Dalton of Dungarvan Brewing Company. There will be Eight Degrees beer tastings, there will be matching the beer with food available at the festivals and, yes, there will be brownies. Chocolate and Knockmealdown Porter Brownies to be precise. If you’re at any of the festivals, call by to the Theatre of Food tent and say hi. Just follow your nose: when those brownies go in the oven they make sure everyone knows that they’re busy cooking. 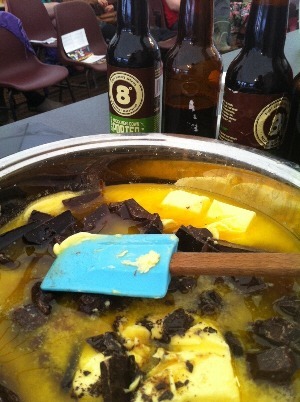 Chocolate brownies + beer = a heavenly pair? See what you think! Learn how to savour Irish craft beer, match it with food and use it in baking. Talking, baking – and tasting! – Irish craft beer. You can also catch Cam, the Eight Degrees Brewing Aussie at EP. Cam will talk about the pleasures – and the pain – of turning a random pub conversation idea into the beer that you taste here today: Barefoot Bohemian Pilsner, Howling Gale Ale, Sunburnt Irish Red and Knockmealdown Porter. It was a lot of fun, Magda. I’ve never seen anyone get brownies into the oven as fast as Kristin did on Saturday afternoon! They were ready just in time to taste with the Knockmealdown Porter and we got a great response from the audience.